Right-back Lewie Coyle was shown a straight red card as Leeds United’s development squad lost 1-0 at Watford this afternoon. The teenage defender, who was captaining the Under-21s, received his marching orders following a foul on Watford’s Ashley Charles 10 minutes into the second half. Leeds were battling to recover from a 27th-minute strike from Alex Jakubiak and despite losing Coyle, United passed up numerous chances to force a draw. Eoghan Stokes drove a great opportunity over the crossbar from close range and was denied by Watford goalkeeper Rene Gilmartin in the last minute of the match. Lewis Walters also went close late on with a shot which flew narrowly wide. Paul Hart’s starting line-up included prolific youngster Mallik Wilks. The first-year scholar was handed a start on the back of an impressive string of performances for United’s Under-18s, including a four-goal haul in a recent rout of Queens Park Rangers. 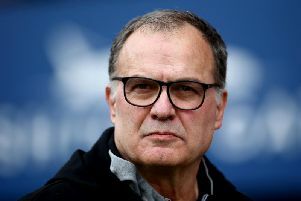 A young team featured no senior players, however, as Leeds began their prepation for Saturday’s Championship clash with Brighton at Elland Road. United: Peacock-Farrell, Coyle, Vann, Skelton, Denton, Purver, Lyman, Parkin, Walters, Stokes, Wilks.